If you are a first-time visitor to Dreamclinic Massage Redmond, schedule today and save $20 from our regular price of $108 for 60 minutes of massage. Use Promo Code BRWEB20. Schedule Now. After pulling into the Dreamclinic driveway, continue to the back of the parking lot and continue to the right. After turning you will see the entrance to Dreamclinic, the entrance doors face west. All massage places are not the same. When you visit Dreamclinic Massage you will discover that our therapists have the highest level of skill and genuinely care about your well being. The Dreamclinic difference is that we hire only the best, then provide additional training and a great working environment so that our therapists are in the right frame of mind to give you the truly personalized and effective massage that you expect. Welcome to Dreamclinic Redmond on Bel Red Road, in the Overlake neighborhood bordering Bellevue and Redmond. Dreamclinic supports a healthy, active lifestyle, offering results-driven massage therapy for athletes, busy working professionals and those with muscle injuries or chronic tension. 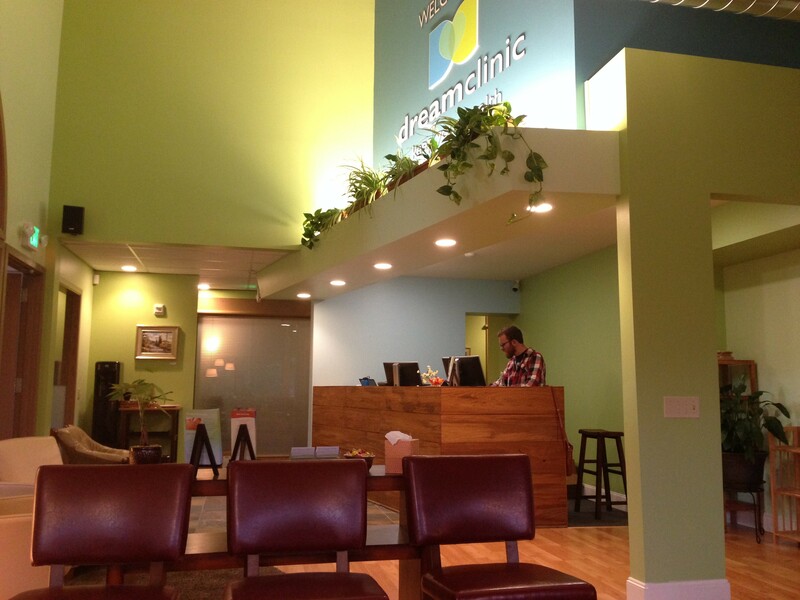 Dreamclinic is the most trusted name for massage therapy in Seattle since 2003. We are delighted to make new friends on the east side and to bring our quality brand of massage therapy to Bellevue and Redmond with the opening of Dreamclinic Redmond in June 2014. We make it easy to get consistently high quality massage on your schedule because we employ only the most highly-skilled and caring specialists that tailor each session to your individual needs. You receive great bodywork at Dreamclinic no matter which massage therapist or acupuncturist you work with. Dreamclinic Redmond with its lovely tree-lined grounds is an oasis of tranquility on Bel-Red Road. The Overlake neighborhood, perched right on the line between Bellevue and Redmond, offers ample parking onsite. It is around the corner from Microsoft campus, across the street from Trader Joe’s, and offers our clients quick easy access to Interstate 520. Dreamclinic Massage Redmond is in the Overlake neighborhood right on the border between Redmond and Bellevue. We are so excited to now be offering massage and acupuncture to these two vibrant communities! Bellevue and Redmond, best known as home to the sprawling Microsoft campus, are two neighborhoods now rapidly emerging as a hub of innovation and technology for the entire Northwest of the United States. Bellevue and Redmond population is diverse, with an ethnic mix from around the world and a significant pool of immigrants from Asia and India. This is also a highly educated, thriving, physically active population that values fitness, health and wellness, which includes massage and acupuncture. An affluent group, Bellevue and Redmond residents in many ways have the best of just about everything to choose from – restaurants, stores, health clubs, etc… With Dreamclinic’s own strong belief in a healthy active lifestyle and our emphasis on excellence in massage therapy, it is perfect fit to have one of our Dreamclinic Massage clinics in this neighborhood to serve Bellevue and Redmond residents.